Cameron Siou, graduate of the Health Leadership Academy’s Innovation by Design course, went onto apply his newfound design thinking skills to a startup venture. Cameron Siou has a tradition with his friends every summer: around late August, the group meets up at Toronto’s Harbourfront to row to Centre Island – the last one there buys dinner. Time spent with good friends and the feel of water gliding against the rowboat’s oars makes this event one of Siou’s favourite days of the year. In fact, the tradition inspired him to develop a machine that helps rowers live this experience 365 days a year. In 2017, during his undergraduate studies at McMaster, Siou got to work using many of the tools he learned in the Health Leadership Academy’s Innovation by Design (IBD) course. Offered to upper year undergraduate and graduate students, IBD introduces students to design thinking methodology, an approach that focuses more on the process and end user, rather than the solution. Armed with newfound design thinking knowledge, Siou consulted rowers, friends, colleagues and gym-goers to better understand pain points in the rowing machine experience. One of the people Siou consulted was Mitchell Barran, now a fourth year Kinesiology student and rower on McMaster’s varsity rowing team. Barran says traditional rowing machines can be “boring and monotonous” but necessary for winter training. Interviewing individuals connected to a given problem is a key tenet of design thinking—something Siou took with him as he launched his entrepreneurial venture. 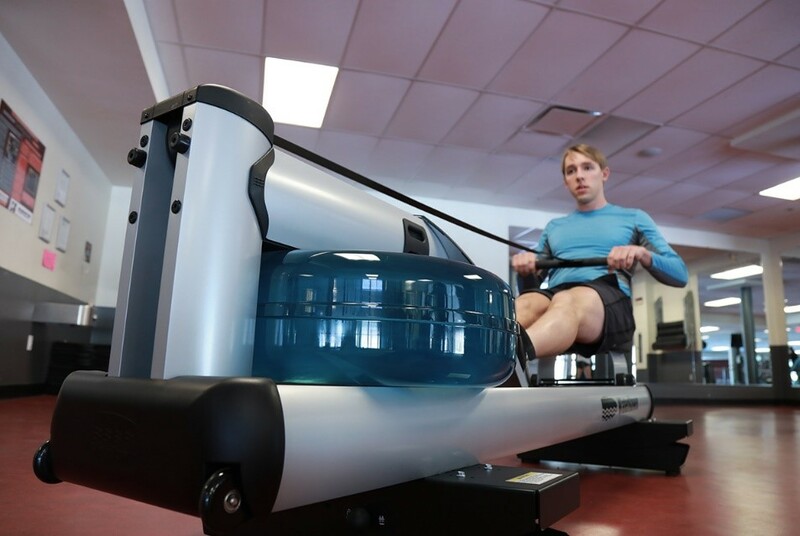 Mitchell Barran, fourth year Kinesiology student and varsity team rower, tries out the Gemini 01 platform at The Pulse. 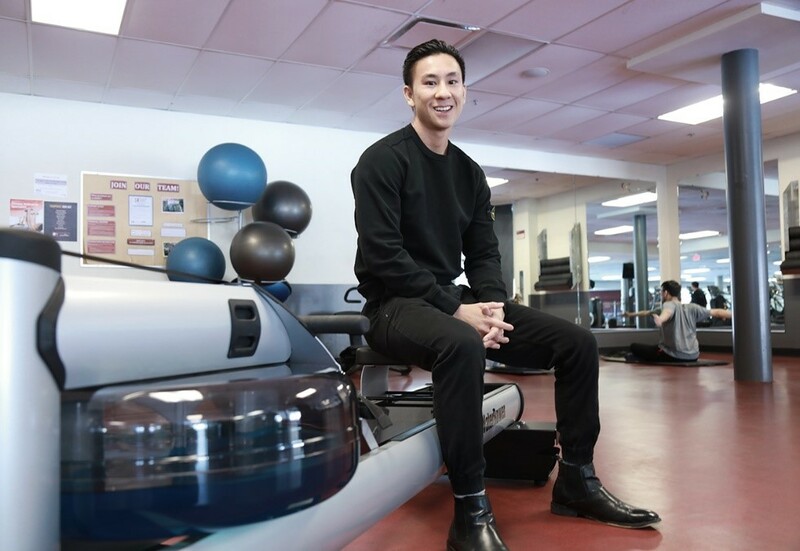 Once Siou collected feedback from a variety of rowing machine users, he entered into a proof of concept trial with McMaster’s Kinesiology and Mechanical Engineering department. The result? A dynamic indoor rowing machine that can be found in several facilities, including The Pulse at the David Braley Athletic Centre. Siou’s company Nfable Inc. developed a new rowing machine platform called the Gemini 01. Initially optimized to work with the WaterRower, the Gemini 01 platform attaches onto the bottom of the rowing machine, adding the tilting aspect of being in a boat. Siou’s technology allows rowers to engage their core and stabilizer muscles, creating a more dynamic rowing experience. Rowers can also connect their rowing experience to the Nfable app, called “Crew Society,” which allows users to track progress over time and challenge friends or family to reach a milestone. The app will launch on the Apple Store later this month. Effectively, Siou and his friends can now remotely race to Centre Island any day of the year—a possibility that makes Siou chuckle and then beam with pride. He says he’s proud to have created something that will bring people together. Moving forward, Siou has plans for the Gemini 01 platform to be in universities, gym chains, rowing clubs as well as retail distributors. In the more immediate future, you can find the Nfable team working with its partners Row for the Cure and Coast to Coast Against Cancer Foundation to support cancer research and preventative medicine.